Use slideshow to navigate through screens in full-screen mode. Present your mockups to customer and/or your team. Discuss your mockups in live workshops. To start the slideshow click the slideshow icon on top toolbar, or press F5 (on Mac, it’s CMD+Shitf+F). Slideshow will open with first screen of the current scenario. Close slideshow with Close button or press the Escape key. 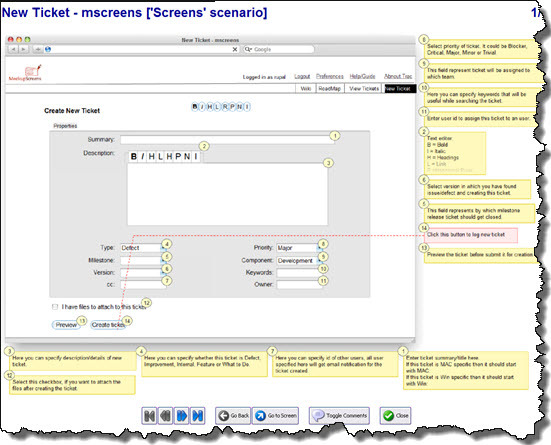 By default, Slideshow displays in a sequence all screens of the current scenario. Clicking on any widget that has a link property jumps to the screen specified as link target. You can navigate through navigation commands. When hovering over widgets that link to other screens, mouse pointer changes to indicate that a link exists and displays the target screen. First – Go to the first screen of the current scenario. Previous – Go to previous screen within the same scenario (shortcut: Up arrow, Left arrow, PageUp key). Next – Go to next screen within the same scenario (shortcut: Down arrow, Right arrow, PageDown key). Last – Go to the last screen of the current scenario. Go back – Go back to screen displayed before the current one. Go to screen – Go to any screen from the current project (opens dialog to choose the screen/scenario). Toggle comments – Show/hide comments. Close – End slideshow (shortcut: ESC key). Open the Options window via “Options” command (top toolbar) or Tools/Options. Show Grid – Toggle gridlines on/off during slideshow. 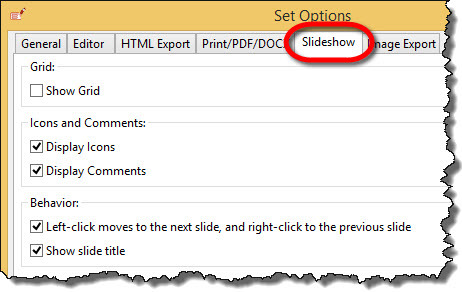 Display Icons – Toggle icons on/off during slideshow. Display Comments – Toggle comments on/off during slideshow. Show slide title – Whether or not to show screen title on the slide.